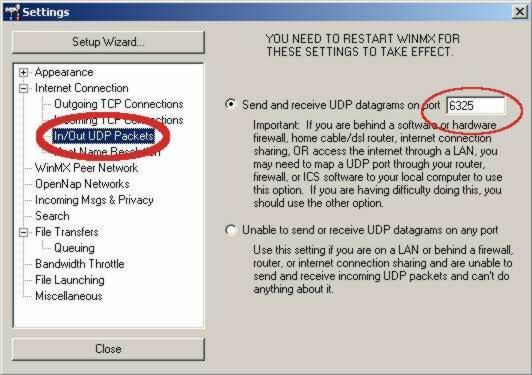 There is also the possibility that you're ISP is blocking WINMX's default ports, to check this you will need to change your IN/OUT UDP port. (16257 instead of 6257 for example). 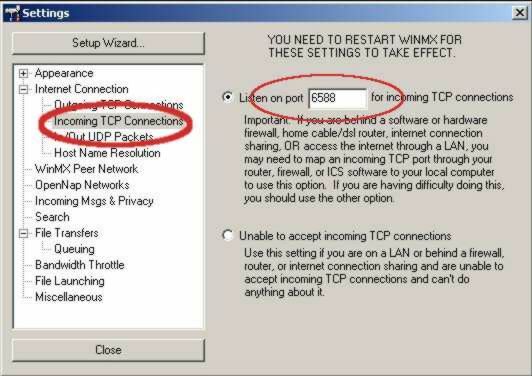 Remember if you try this solution these ports will have to mapped through the Router (If you have one)or you're firewall just as the default ones were. Change the number there from whatever it is now (default is 6699) to something new. This is usually something I change every time I have installed WinMX, not that I have always needed to, but I think its a good thing to diversify the ports, makes it harder for us to be collectively cheated. Then IN/OUT UDP. Change value there also, truthfully this is the major one for uploads. If udp isn't working right, upload speeds will either be horrible, or not at all. It will also interfere with host a chat channel with WinMX. Restart WinMX. Hopefully that should resolve the problem.